Handy annotated overview of AVR devices at AVR Freaks. Error and fix in AVR Studio on AVR Freaks forums. Other (more interesting?) page with tutorials. 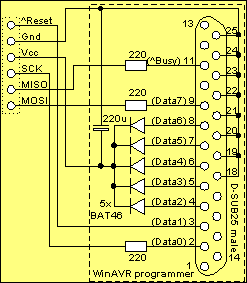 All soft uart implementations use interrupts in one way or the other (timer and/or external). To understand them I'd like to test some more. Next try, inspired by tuxgraphics.org. Programmer description plus how to build, they use this software. "WinAVR Programmer" seems simple enough. Helpful guide to installing eclipse with AVR support.